Many countries serve meatballs as comfort food, as David Tanis explains in the New York Times. A couple weeks ago he published a French/North African version called boulettes that can be made with ground beef or lamb, chopped parsley and cilantro, and an exotic mixture of spices: turmeric, cumin, cloves, nutmeg, ground ginger, paprika, and cayenne. 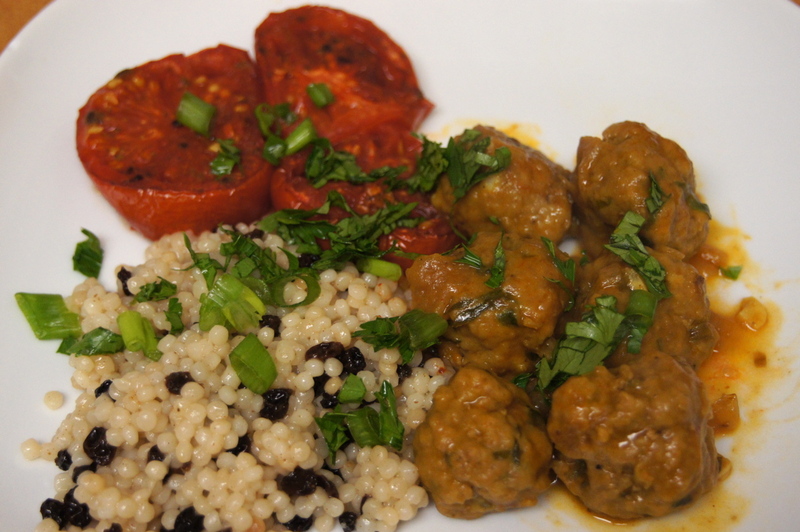 The meatballs are dusted with flour, browned in a saute pan, and then simmered in a tomato-saffron stock. He pairs it with Israeli couscous and roasted tomatoes. I am going to try a new format with my recipe review. These are the factors I consider for the bottom line if a recipe is worth doing. How delicious is it? How long does it take? How much does it cost? There are so many recipes out there that I haven’t made yet – would I make this one again? If readers have any other suggestions for what they would like to know, please let me know. Complexity: multiple steps for the boulettes, including making the tomato-saffron broth beforehand, but nothing too technical. The roasted tomatoes and couscous are very easy. Cost: about $10, but I already had all of the spices on hand. Buying new spices for this dish would be expensive. Deliciousness: good (3 of 5 stars). The boulettes are soft, juicy, and aromatic with spices. They go well with the roasted tomatoes and couscous. Good suggestions about health and aesthetics!